Today's hardworking K-9s in the military, law enforcement, and homeland security are put in danger on a daily basis while doing their jobs. Whether a dog is searching for drugs, apprehending a criminal, or working with explosives, they are often put in life threatening situations. A Police K-9 will always give 110% while on duty and serve unconditionally, which is why we need to keep them safe on the job. 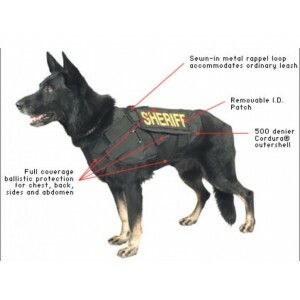 Our K-9 armored vests are designed to fit comfortably on your K-9 partner, and ensure ultimate safety and protection. The vest is made with Standard Ballistic and Stab Protection that will stop Level 3A threats including handgun rounds up to a .44 magnum. Proudly made in the USA and backed by our 1 year manufacturer warranty for craftsmanship.